Canoe & Kayak Rentals and Sales is proud to partner with Otsego Land Trust at Brookwood Point, to rent Kayaks and SUPs on Otsego Lake. Otsego Land Trust is a not for profit land & water conservation organization. We at C&K are extremely excited and grateful to have this oppourtiunty to rent kayaks from Brookwood Point. You must be 18 years of age to rent a boat , you are welcome to bring children of all ages. Reservations are accepted only for groups. For exact directions from your location, click the map. 5 minutes north of The village of Cooperstown, on rt. 28 straight though the only traffic light in the village of Cooperstown, turn left at the stop sign onto lake street. Late renters (past 6:00 pm) will be charged the full daily rate for rentals. Water Classification - Open lake paddling! 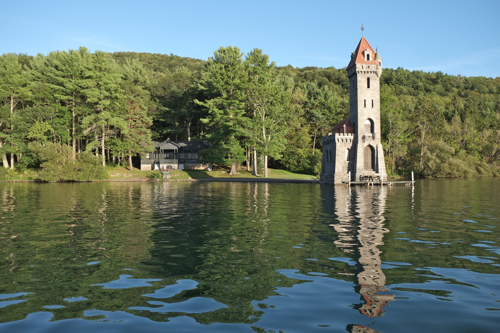 Cooperstown Rental Location: Otsego lake: 9 miles long • average depth of 89ft. • max. depth 167ft • 4,046 acres • 20.3 miles of shoreline. Helpful to have: Sun screen, bug spray, towels, snacks and drinks. If you forget anything, you can grab it at our shop. Wildlife: Watch for bald eagles, blue herons, ducks, egrets, song birds, fish and much more! Fishing: We have fishing poles for rent or sale.